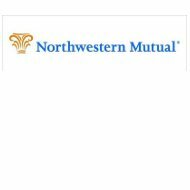 A review of the Northwestern Mutual Health Insurance Company leads to Northwestern Mutual. With corporate offices located in Milwaukee, Wisconsin, the company has been in existence since 1857. It provides insurance and investment products to over 3,000,000 customers throughout the United States. Their products are offered to both individuals and businesses; however, their health insurance offerings are only through employee benefit plans that are available to businesses. Looking for a personal health insurance plan for your family? You’ve come to the right place; enter your zip code now in the box provided for health insurance providers in your area. Northwestern Mutual is the largest direct provider of personal life insurance. The company has withstood tests of time and events such as wars, stock market crashes, recessions, depressions, and 9/11; it remains financially strong to this day. The company prides itself on “doing the right thing” by its clients in times of great tragedies, putting the needs of the client first. With the tragedy of 9/11, 157 of Northwestern Mutual policyholders perished, the largest amount since the sinking of the Titanic. The company was there for the surviving family members and processed $125 million in claims that weekend that were paid within five days of receipt of claims. Northwestern Mutual offers several options for life insurance based on the needs of their clients. These including term life insurance, universal life insurance and variable life insurance. In addition to the products listed above, Northwestern Mutual offers a variety of products to allow their clients to diversify their portfolios along with financial planning services. These products include investment opportunities such as bonds, custodial accounts, and money market funds. Northwestern Mutual also offers insurance, employee benefit plans, and retirement solutions for businesses. Many businesses rely on business insurance to plan for the future by providing for business continuation and succession, executive benefits, and key person coverage. Taking these factors into consideration when planning allows the means for the business to continue in the event of the unexpected, including the death or disability of key personnel. Business disability insurance such as disability overhead expense, disability key person, and disability buy-out insurance also provide the means needed to continue a business in the event the owner or key personnel becomes disabled, and are unable to direct or work for the business any longer. Northwestern Mutual has received high ratings from all of the major independent insurance rating agencies. These ratings attest to the company’s overall financial strength and ability to meet its claims obligations. A.M. Best Company has awarded Northwestern Mutual with the highest rating of “A++.” Standard and Poor’s has given the company a rating of “AA+.” Their experience and stable earnings have also earned them high marks from both Moody’s (Aaa) and Fitch Ratings (AAA). Additionally, Northwestern Mutual has received many accolades for their financial strength. They were ranked 112th on Fortune 500’s list with having over $180 billion in assets. Northwestern Mutual has received many awards for such career-related lists as Bloomberg’s BusinessWeek’s 2009 Best Internship and 50 Best Places to Launch a Career. Interested persons should go to their website to register for and view available opportunities within the company. Find the health insurance you need! It’s as easy as entering your zip code in the box provided and we will show you rates and quotes from health insurance providers in your area.